Sometimes she showed excitement over everyday things, like the lamp she bought with S&H Green Stamps, or the delicious corn on the cob she picked up at the farmers market and would boil for exactly four minutes. My grandmother serving a slice of pumpkin pie while my mother looks on. Whenever figure skating came on TV, she would urgently shout up the stairs for me to come and watch. And her Hungarian Christmas cookies. She thought they were the most delicious delicacies in the world. 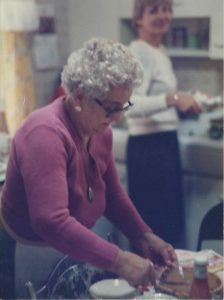 She and my aunt and grandmother would fill enormous bins with these filled, yeasted cakes called “kifli.” And chocolate. Well, I won’t get started. My point is this: It seems that as children are allowed to entertain themselves with computer games, sometimes even as babies, their focus moves away from the human face and spirit. Eye contact, and possibility of imitation, disappears. And they must find their own joy in a handheld device. Yes, they laugh and become animated. But the game is not relating to them as my mother related to me and I related to my children. It’s something that exists on another plane, and is really inanimate. Not only do children believe they are made happy by computer games, they become addicted to them, as a result, are less happy when not permitted to play. As we have become a more and more technologically sophisticated society, I think children are becoming less interested in – and more disengaged – from adults. I see this in schools when I substitute teach. It’s as though children’s memory neurons haven’t been programmed for job of sharing joyful exuberance. And there’s more than a good chance that this is the case. According to findings of neuro-psychologists such as Allan Schore of UCLA, an infant’s DNA is not fully programmed until well into the first year of life, and is highly influenced by the environment. In almost every classroom I find at least one child who is hostile toward the suggestion of receiving adult assistance. And often I am warned about them. They positively refuse to bond with the lesson at hand, and will sit and do nothing, often finding any reason at all to become upset. Those children then grow up having had little early experience with joyful emotions that come from shared human experience. I should think the lack would result in less joy in just about everything. Some children undertake every activity with the same absent look of boredom, and even express agitation. And there’s a definite problem with following what the teacher is saying. I find that children of all ages have a hard time with listening. Maybe because most of the time they are relating to themselves, urging themselves on to win a computer game, instead of interacting with a mom or dad. Because more mothers are working, and have less time for interacting with their children, they could very well perform their duties in a more perfunctory way. I know it was true of me when I worked outside the home only two days a week. Mothers are often exhausted and unable to muster the necessary energy to deal with children. The result, in my opinion, is that -+kids are missing out on a normal function of the human spirit. And that is joy. We need to convey joy to our children from the day they are born. And allow them to borrow our enthusiasm for life, so they will absorb the feeling, and take ownership of it themselves. No matter what our circumstances.